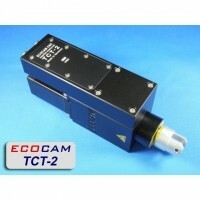 ECOCAM Tangential Creasing Tool TCT-2 | DamenCNC B.V.
ECOCAM is introducing a new tangential creasing tool: the TCT-2. Axial, radial and torsional stiffness as well as wear resistance is optimized. The outside dimensions and the fixing points have not been changed, the integrated new electronic system is compatible with the previous one and all accessories and creasing wheels are compatible with the new system. The TCT-2 will be available from stock in June 2016.